The life story of the legend, told completely in her own words. The Greek-American soprano’s mystique lives on in this fawning but fascinating documentary. Director Volf has unearthed lots of material, in particular a long-lost TV interview with David Frost that acts as a structural device and contains the diva’s sad claim that a woman’s main vocation is to have a family and raise children. 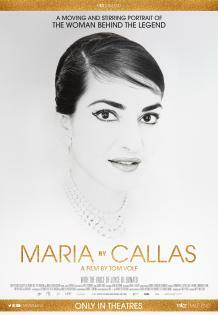 Footage of Callas’s opera appearances in the 50s – when her voice was at its peak – shows off her natural stage presence, and there’s lots to document various controversies: her cancellations, her fight with the Met’s Rudolf Bing, and the last act of her life, which came to resemble a tragic opera itself. Throughout, the musical choices are tasteful and thematically apt, and Volf shows respect for his subject by revealing footage, but no singing, from Callas’s disastrous comeback tour in the 70s. A must-see for opera lovers.